On July 8 I attended a live webinar on Holacracy. Brian Robertson invented Holacracy in 2007 as he perfected the organizational structure of his company Ternary Software. Holacracy is an “operating system” for organizations that nixes hierarchies in favor of holons or “circles,” and does away with job descriptions, instead assigning “roles” that are nested within the circles. 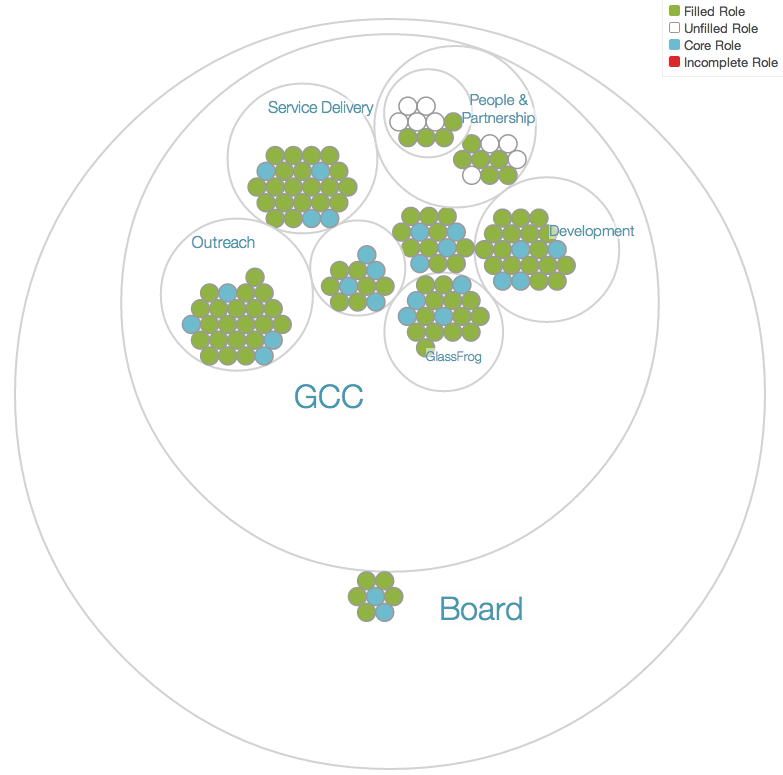 For example, a company would have a general company circle, or GCC, and within it circles like “development” or “service delivery,” and within each of those would be the individual roles. Zappos CEO Tony Hsieh, who implemented Holacracy company-wide, inspired Brian to compare a Holacracy-run company to a city where everyone has roles that they own, like property, and everybody has the power to make decisions regarding that role’s domain without the permission of a manager. Brian stated in the webinar that when a CEO implements Holacracy, it is like a benevolent dictator proclaiming, “I hereby dissolve my right to manage top-down, and instead I will allow you (the nation to whom he/she is speaking) self-organaize from the bottom-up.” Brian has also compared Holacracy to the physical body of an organism: it does not have one boss cell telling all the cells in all the organs what to do. I read Brian’s book on Holacracy, and it details not only the structure of an organization that implements Holacracy, but introduces unique meeting styles that maximize collaboration between roles as well as the potential for resolving issues and innovating solutions. The bottom line in all this is a noble one: to create fast, agile, decentralized organizations. Holacracy is not the only version of this idea floating around the zeitgeist. Team of Teams by General Stanley McChrystal was a wonderful read covering the U.S. Military’s transformation from an enormously efficient “Taylor-esque” machine into a highly adaptive network of teams. This is also the theme of another book I have not read called Reinventing Organizations by Frederic Laloux. I have researched that this book identifies several paradigm shifts that have occurred throughout human history, and ties each one with an organizational paradigm. These two treatises both agree that past axioms of management include hierarchical structures and machine-like efficiency, and that the latest paradigm is that of a decentralized, self-managed, and evolutionary organization. In this post called A Worldview Emerges, I mention one of my favorite papers Electronic Markets and Electronic Hierarchies, which introduced me to the idea of a market as being the opposite of a hierarchy. A hierarchy coordinates the flow of goods or services through the value chain by controlling and directing, while a market coordinates this flow through supply and demand. For example, WidgetCrafters is a manufacturer of widgets and can compete with other widget manufacturers in a market for shelf space among widget retailers, or they can sell directly to consumers via their own hierarchically-managed retail outlets. The tie-in is clear: the new paradigm in management is the utilization of a decentralized network of self-managed subunits or individuals collaborating and competing in a “micro” market to add value to the greater organization. Holacratic management might be an essential piece of proprietism, as it is a step-by-step play book of how a network of sole-proprietors could coordinate activity within a greater organization. This entry was posted in Uncategorized on 22 July, 2015 by Paul.